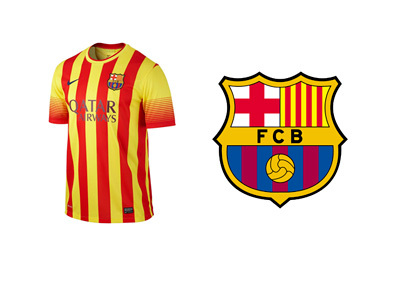 Barcelona FC are going to wear the yellow and red Catalan flag 'Senyera' strip for their match vs. Athletic Bilbao on Saturday, September 13th, 2014 at Camp Nou. This will be the first time in 115 years that Barcelona will not play a home match wearing their first kit. A lot of eyebrows have been raised with this move, as it seems that Barcelona FC are doing this in support of the Catalan independence movement, only two short days after the National Day of Catalonia (Diada Nacional de Catalunya), which commemorates the defeat of Catalonia during the War of the Spanish Succession. Although it is clear that in this instance football and politics are being mixed, the official statement from the club is that the change of jerseys is to pay tribute to the 300th anniversary of the fall of city of Barcelona to Filip V and the French in 1714. For the people of Catalonia, Barcelona FC is more than just a football club. Going back in time, Barca is a political icon as much as it is a sporting one. On Saturday, Athletic Bilbao will wear their Basque Country kits, with green shirts, white shorts and red socks. This year's celebrations of the Catalan National Day are especially emotional as they come one week before Scotland holds a referendum on independence from the United Kingdom. The big football related question is, if Catalonia, with the population of 7.5 million, one day separates from Spain, will Barcelona FC still continue to compete in the Spanish La Liga?